Rūmī, in full Jalāl al-Dīn Rūmī, also called by the honorific Mawlānā, (born c. September 30, 1207, Balkh [now in Afghanistan]—died December 17, 1273, Konya [now in Turkey]), the greatest Sufi mystic and poet in the Persian language, famous for his lyrics and for his didactic epic Mas̄navī-yi Maʿnavī (“Spiritual Couplets”), which widely influenced mystical thought and literature throughout the Muslim world. After his death, his disciples were organized as the Mawlawiyyah order. Rūmī’s use of Persian and Arabic in his poetry, in addition to some Turkish and less Greek, has resulted in his being claimed variously for Turkish literature and Persian literature, a reflection of the strength of his influence in Iran and Turkey. The influence of his writings in the Indian subcontinent is also substantial. By the end of the 20th century, his popularity had become a global phenomenon, with his poetry achieving a wide circulation in western Europe and the United States. Jalāl al-Dīn’s father, Bahāʾ al-Dīn Walad, was a noted mystical theologian, author, and teacher. Because of either a dispute with the ruler or the threat of the approaching Mongols, Bahāʾ al-Dīn and his family left their native town of Balkh about 1218. According to a legend, in Nīshāpūr, Iran, the family met Farīd al-Dīn ʿAṭṭār, a Persian mystical poet, who blessed young Jalāl al-Dīn. 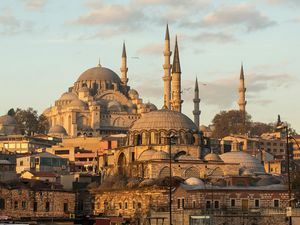 After a pilgrimage to Mecca and journeys through the Middle East, Bahāʾ al-Dīn and his family reached Anatolia(Rūm, hence the surname Rūmī), a region that enjoyed peace and prosperity under the rule of the Turkish Seljuq dynasty. After a short stay at Laranda (Karaman), where Jalāl al-Dīn’s mother died and his first son was born, they were called to the capital, Konya, in 1228. Here, Bahāʾ al-Dīn Walad taught at one of the numerous madrasahs (religious schools); after his death in 1231 he was succeeded in this capacity by his son. A year later, Burhān al-Dīn Muḥaqqiq, one of Bahāʾ al-Dīn’s former disciples, arrived in Konya and acquainted Jalāl al-Dīn more deeply with some mystical theories that had developed in Iran. Burhān al-Dīn, who contributed considerably to Jalāl al-Dīn’s spiritual formation, left Konya about 1240. Jalāl al-Dīn is said to have undertaken one or two journeys to Syria (unless his contacts with Syrian Sufi circles were already established before his family reached Anatolia); there he may have met Ibn al-ʿArabī, the leading Islamic theosophist whose interpreter and stepson, Ṣadr al-Dīn al-Qunawī, was Jalāl al-Dīn’s colleague and friend in Konya. The decisive moment in Rūmī’s life occurred on November 30, 1244, when in the streets of Konya he met the wandering dervish—holy man—Shams al-Dīn (Sun of Religion) of Tabrīz, whom he may have first encountered in Syria. 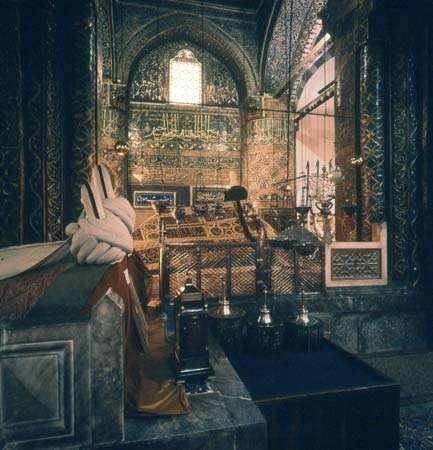 Shams al-Dīn cannot be connected with any of the traditional mystical fraternities; his overwhelming personality, however, revealed to Jalāl al-Dīn the mysteries of divine majesty and beauty. For months the two mystics lived closely together, and Rūmī neglected his disciples and family so that his scandalized entourage forced Shams to leave the town in February 1246. Jalāl al-Dīn was heartbroken, and his eldest son, Sulṭān Walad, eventually brought Shams back from Syria. The family, however, could not tolerate the close relation of Jalāl al-Dīn with his beloved, and one night in 1247 Shams disappeared forever. In the 20th century it was established that Shams was indeed murdered, not without the knowledge of Rūmī’s sons, who hurriedly buried him close to a well that is still extant in Konya. This experience of love, longing, and loss turned Rūmī into a poet. His poems—ghazals (about 30,000 verses) and a large number of robāʿīyāt (“quatrains”)—reflect the different stages of his love, until, as his son writes, “he found Shams in himself, radiant like the moon.” The complete identification of lover and beloved is expressed by his inserting the name of Shams instead of his own pen name at the end of most of his lyrical poems. The Dīvān-e Shams (“The Collected Poetry of Shams”) is a true translation of his experiences into poetry; its language, however, never becomes lost in lofty spiritual heights or nebulous speculation. The fresh language, propelled by its strong rhythms, sometimes assumes forms close to popular verses. 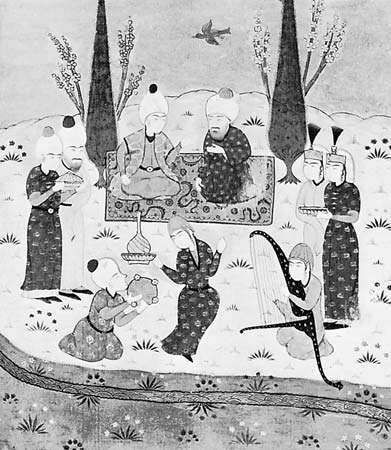 There would seem to be cause for the belief, expressed by chroniclers, that much of this poetry was composed in a state of ecstasy, induced by the music of the flute or the drum, the hammering of the goldsmiths, or the sound of the water mill in Meram, where Rūmī used to go with his disciples to enjoy nature. He found in nature the reflection of the radiant beauty of the Sun of Religion and felt flowers and birds partaking in his love. He often accompanied his verses by a whirling dance, and many of his poems were composed to be sung in Sufi musical gatherings. A few years after Shams al-Dīn’s death, Rūmī experienced a similar rapture in his acquaintance with an illiterate goldsmith, Ṣālāḥ al-Dīn Zarkūb. It is said that one day, hearing the sound of a hammer in front of Ṣalāḥ al-Dīn’s shop in the bazaar of Konya, Rūmī began his dance. The shop owner had long been one of Rūmī’s closest and most loyal disciples, and his daughter became the wife of Rūmī’s eldest son. This love again inspired Rūmī to write poetry. Manuscript illumination from the Mas̄navī-yi Maʿnavī of Rūmī, 1295–96; in the British Museum (MS. OR. 7693, fol. 225 b.). Courtesy of the trustees of the British Museum; photograph, J.R. Freeman & Co. Ltd.
After Ṣālāḥ al-Dīn’s death, Ḥusām al-Dīn Chelebi became his spiritual love and deputy. Rūmī’s main work, the Mas̄navī-yi Maʿnavī, was composed under his influence. Ḥusām al-Dīn had asked him to follow the model of the poets ʿAṭṭār and Sanāʾi, who had laid down mystical teachings in long poems, interspersed with anecdotes, fables, stories, proverbs, and allegories. Their works were widely read by the mystics and by Rūmī’s disciples. Rūmī followed Ḥusām al-Dīn’s advice and composed nearly 26,000 couplets of the Mas̄navī during the following years. It is said that he would recite his verses even in the bath or on the roads, accompanied by Ḥusām al-Dīn, who wrote them down. The Mas̄navī, which shows all the different aspects of Sufism in the 13th century, often carries the reader away with loose associations of thought, so that one understands what subjects the master had in mind at a particular stage of his life. The work reflects the experience of divine love; both Ṣalāḥ al-Dīn and Ḥusām al-Dīn were, for Rūmī, renewed manifestations of Shams al-Dīn, the all-embracing light. He called Ḥusām al-Dīn, therefore, Ḍiyāʾ al-Ḥaqq (“Light of the Truth”); ḍiyāʾ is the Arabic term for sunlight. Rūmī lived for a short while after completing the Mas̄navī. He always remained a respected member of Konya society, and his company was sought by the leading officials as well as by Christian monks. His burial procession, according to one of Rūmī’s contemporaries, was attended by a vast crowd of people of many faiths and nationalities. His mausoleum, the Green Dome, is today a museum in Konya; it is still a place of pilgrimage, primarily for Turkish Muslims. Ḥusām al-Dīn was Rūmī’s successor and was in turn succeeded by Sulṭān Walad, who organized the loose fraternity of Rūmī’s disciples into the Mawlawiyyah, known in the West as the Whirling Dervishes because of the mystical dance that constitutes their principal ritual. Sulṭān Walad’s poetical accounts of his father’s life are the most important source of knowledge of Rūmī’s spiritual development. Besides his poetry, Rūmī left a small collection of occasional talks as they were noted down by his friends; in the collection, known as Fīhi mā fīhi (“There Is in It What Is in It”), the main ideas of his poetry recur. There also exist sermons and a collection of letters (Maktūbāt) directed to different persons. It is impossible to systematize his ideas, which at times contradict each other, and changes in the use of symbols often puzzle the reader. His poetry is a most human expression of mystical experiences, in which readers can find their own favourite ideas and feelings—from enthusiastic flights into the heavens to matter-of-fact descriptions of daily life.